You enter a large dark room. Down the center runs a continuous line of tables. Calligraphers are seated at both sides. Only their hands and their work are illuminated. All is silent. Presented in a spot-lit and silent setting, the performance hopes to focus on the act of writing itself, drawing attention to the power, vitality, and variety of letterforms from throughout history and around the world. The featured calligraphers will demonstrate many styles including Italic, ornate Copperplate and Spencerian scripts, Celtic “Uncial”, and Gothic hands. Non-Western alphabets will also be highlighted with artists representing Asian, Middle-Eastern, Indian, Mediterranean, and other European alphabets. They will also employ various media used in modern and traditional manuscripts such as animal vellum, quill pens, illumination, and gilding. Based on original performances in Belgium and Germany devised by renowned calligrapher, Brody Neuenschwander, this event is organized purely to draw attention to the aesthetic and athletic beauties of artistic lettering. Information will be available on all demonstrated styles, as well as guides to area calligraphers and calligraphy instruction. 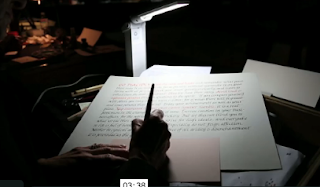 The following short video by Felipe Barral showcases the event and shares the thoughts of its creator, Emily Canter, about calligraphy in today's world and about the importance of being together in silence. She feels the experience was valuable for both the calligraphers and the viewers.